The body adapts to external and internal patterns of stress and recovery. Exercise stress can be determined from the output data of a heart rate monitor. A steady-state heart rate workout requires that students maintain exercise intensity and heart rate throughout the exercise session. The heart sends us vital information about our health and happiness. Emotional fitness training shows us how to listen to our hearts by becoming aware of our emotional states; it also helps us develop the ability to consciously shift to a healthier zone if we happen to be in a toxic zone. 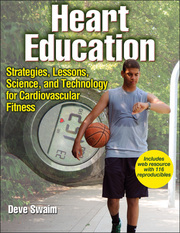 Heart Education uses a 10-step program, with accompanying lesson plans, for physical education teachers to help students ages 11 through 18 learn and apply basic heart monitoring functions; set realistic health, fitness, and athletic performance goals; and choose appropriate activities to meet their goals. An accompanying web resource and 25 workouts and strategies for using heart zones is also included.